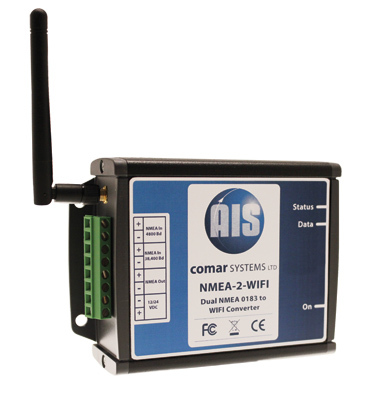 The new NMEA-2-WIFI unit provides a low cost method of setting up a wireless network. Use it with seaPro to wirelessly transmit your electronic data including position, AIS data, depth, wind, compass etc on board. Simple to set up, the NMEA-2-WIFI unit has 2 NMEA inputs which are multiplexed to a single high speed data output which transmits NMEA 0183 data over WIFI for viewing on a smart phone or tablet using suitable Apps* or a PC Navigation program such as seaPro, and provides 2 way communication between the WIFI device and any suitable NMEA devices. With 2 inputs, it can accept NMEA 0183 data at 4800 from any GPS, Chart plotter or Instruments, plus a 38400 baud input from any AIS receiver or transponder, so you only need one unit to collect and transmit all the navigation data to your portable device over WIFI. For a vessel with a chart plotter at the nav station, using the Comar NMEA-2-WIFI, the helmsman can view all the navigation data* on deck via a a smartphone such as an android or iPhone or tablet. For boats with a chart plotter at the helm you can check all the critical navigation data down below, making your boats data truly portable.